The protest began outside the W3C office and continued with a march past Google's Cambridge office, to Microsoft's office nearby. The companies are both supporters of Encrypted Media Extensions (EME), the proposal to enshrine DRM in Web standards. The protest included free software users and developers, including Richard Stallman and Chris Webber, the maintainer of the GNU MediaGoblin decentralized publishing platform. A small number of protesters split from the group, their actions were not condoned by the FSF, to enter the W3C meeting but they were ejected by police. DRM in Web standards would make it cheaper and more politically acceptable to impose restrictions on users, opening the floodgates to a new wave of DRM throughout the Web, with all the vulnerabilities, surveillance and curtailed freedom that DRM entails. In the week before the protest, Dutch activists held their own demonstration at the Amsterdam W3C office, and a Brazilian Web expert met with staff at the W3C office in São Paulo. 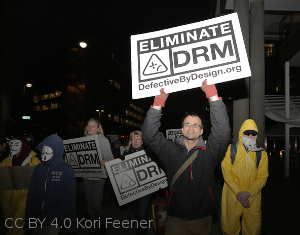 Concerned people from around the world posted selfie photos with protest signs against DRM, many in front of other W3C offices. For every person at the protest, there were about five hundred who spoke up online against Encrypted Media Extensions. "The fight against digital restrictions in Web standards is a new front in the struggle for liberty and expression on the global network. It matters for many of the same reasons as protecting strong encryption and net neutrality, or reigning in online surveillance: increasingly, the Web mediates our politics and our society. We cannot be free without a free Web" said by Zak Rogoff, FSF campaigns manager. The W3C responded to the pressure with multiple posts on the topic in recent weeks, and participated in a public dialogue about the issue following the protest. The dialogue was hosted by the MIT Media Lab and included Richard Stallman of the Free Software Foundation, Joi Ito of the Media Lab and Danny O'Brien of the Electronic Frontier Foundation (EFF). At the public dialogue, W3C staff member Harry Halpin pledged to resign in protest if the standards body recommend Encrypted Media Extensions. The FSF, EFF and others concerned with Internet and software freedom have been protesting Encrypted Media Extensions since 2013. The Free Software Foundation's opposition to Encrypted Media Extensions has included a petition to Stop the Hollyweb, signed by more than 33,000 people and delivered to the W3C with fanfare, a joint letter signed by 27 organizations, and a boycott against Netflix for its role in developing Encrypted Media Extensions. This work is coordinated through the Foundation's anti-DRM campaign, Defective by Design.